Do you pin in the dark? During your lunch hour? Or as a break from a boring load of work? 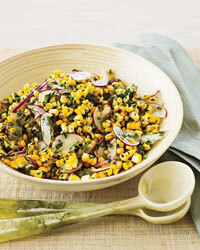 Let us direct you to one of the most popular summer pins on F&W's Pinterest page: Raw Corn and Radish Salad with Spicy Lime Dressing. This fresh, fast side dish (or light main) has been shared more than 1,600 times. In its favor: A best-ever summer vegetable at the height of the season; a puckery lime dressing flavored with jalapeños and honey; and, maybe most crucially, the fact that it can be made without turning on a stove. For more weekend inspiration, check out F&W's other of-the-moment boards like Healthy Summer Recipes and Beautiful Peach Recipes.